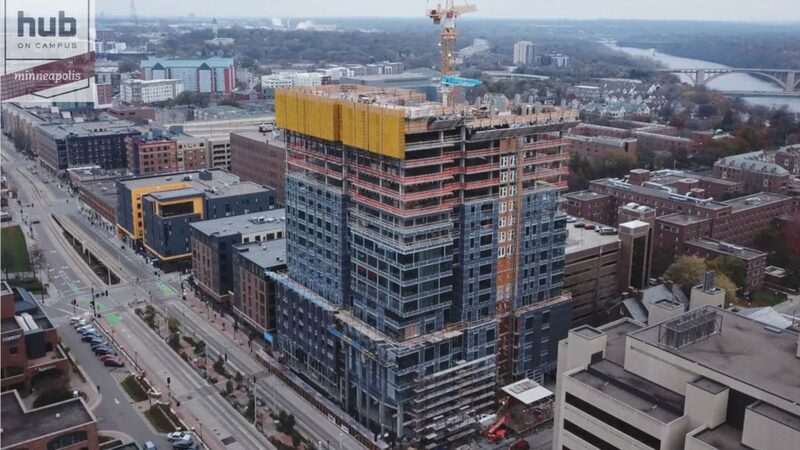 The Hub at Minneapolis has topped off in downtown Minneapolis, and is on track for opening in summer 2018. Designed by Hartshorne Plunkard Architecture for Core Spaces and Harbor Bay Real Estate Advisors, the 26-story tower will offer 407 student residences, on-site retail space and concealed parking, and extensive amenities. Located at 311 Harvard SE, the transit-oriented development is convenient for University of Minnesota Twin Cities students, and offers sweeping views of the Mississippi River, downtown Minneapolis, and TCF Bank Stadium. HPA’s project team designed the 268’ tall high-rise to complement the existing urban wall, and the post-tensioned concrete structure is clad in glass and textured metal panels in a warm palette of grey, brown and silver. At the prominent corner of Washington Avenue and Harvard Street, the pedestrian experience will be activated by the double-height retail storefront, and enhanced by outdoor seating, extensive landscaping and streetscape amenities. Hub at Minneapolis will offer a variety of choice for residents, including 80 unique types ranging from micro-units and studios through four-bedroom layouts. Amenities include a fitness center, club room, and outdoor pool deck, as well as an outdoor infinity-edge spa and one bicycle parking space per bedroom.